This is a quick, easy, and delicious recipe for a busy night! Chop the broccoli and onions into small pieces and saute in pan until soft, and then add in frozen spinach. Combine sauteed vegetables, chickpeas, and brown rice in bowl. Pour in balsamic vinegar and basil and stir well, then add soy sauce to taste. One of our very first posts was a peach-raspberry crisp, which was an amazing summer dessert. 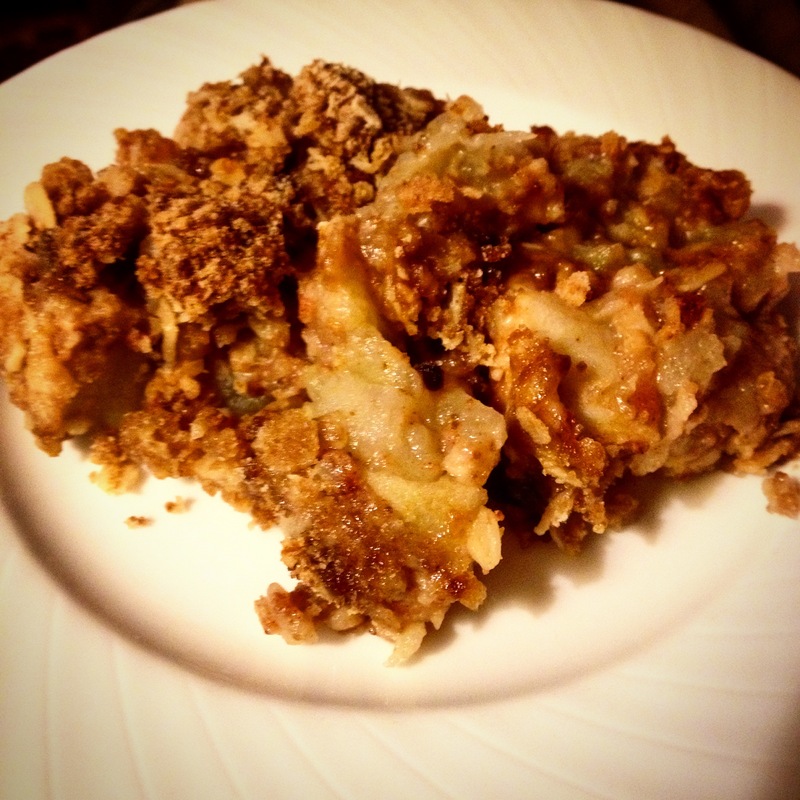 Now that it’s fall, we’ve moved onto apple crisp. The topping is exactly the same, but the filling is different and perfect for autumn. In a small bowl, combine all topping ingredients. We found that cutting up the butter and then mushing it in with our hands was the best way to get the desired texture. It should be very crumbly and have small chunks, but no particularly large pieces. Peel and chop apples into 1-inch sized pieces. In a separate bowl, add all filling ingredients and mix. Pour the filling into an ungreased 8×8 pan. Spoon filling on top evenly. Make sure to get the edges and corners! Bake at 350 for 45-50 minutes, or until bubbling and golden brown. One of the reasons we love when it starts to get cold is the autumn-specific dishes! These root vegetables are a perfect side dish for a fall or winter day. Chop the carrots and parsnips into small (1-inch or so) pieces, and the potatoes into slightly larger pieces. Line large pan with parchment paper and add in vegetables. Pour the lemon juice, mustard, and olive oil over the vegetables and mix. Cover baking pan with foil. Bake for 45 minutes at 450, and then remove the foil from the top of the pan. Stir and return to oven for an additional 45 minutes, stirring occasionally throughout. Leave in oven until brown and crispy; you may need to add more oil and allow the vegetables to bake for longer. This cauliflower recipe is both simple and delicious – what more could you ask for? Cut the head of cauliflower into florets and distribute in casserole dish. Drizzle with olive oil and balsamic vinegar and stir so that the pieces are evenly coated. Sprinkle with salt and pepper. Bake in oven at 400 until beginning to brown (about 15 minutes) and then mix florets around to allow the other side to brown. Allow to cook for another 15 minutes, or until nicely roasted on both sides, and then remove from oven and allow to cool. Add more salt and pepper to taste.